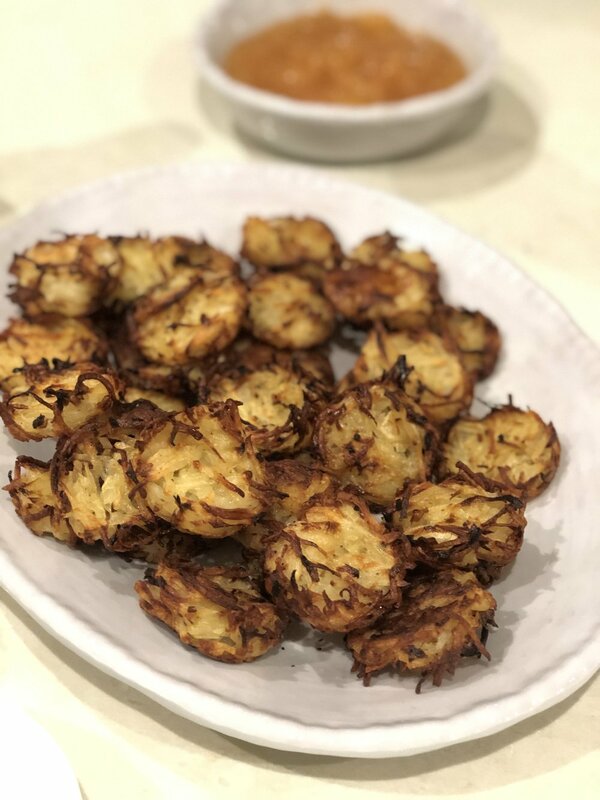 You wouldn’t believe it, but these Hanukkah latkes are oven-baked and absolutely delicious. You’ll avoid the smell of oil, the clean-up of oil, and the less-than-healthy benefits of oil—which leaves you with all the goodness of crispy golden potato pancakes and a side of applesauce. Happy holidays! 1. Preheat your oven to 400 degrees. Meanwhile, add potatoes and onion to a large bowl. Mix in olive oil, eggs, salt and pepper. 3. Spray cupcake baking pans well with the oil. Use a tablespoon to distribute the mixture and press/flatten into each cup. Spray tops with oil. 4. Bake in the oven for about 40 minutes, flipping halfway through. If the tops aren’t browning enough, turn the oven on broil for a few minutes until crispy. Serve with sour cream and applesauce.